Finding creative ways to sell a movie with no name stars and an unknown director can be difficult and often, a shorthand is to compare a movie to something with name recognition. 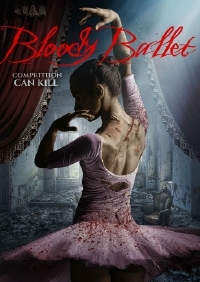 In the case of Brett Mullen's feature film debut Bloody Ballet, the comparisons being made are to Suspiria, likely because both movies feature dancers, but the two movies are so far removed from each other in both theme and style that the comparison feels more like a detriment than a help. Bloody Ballet tells the story of Adriana, a ballerina with a tormented past. When she lands the lead role in the Nutcracker, her carefully curated world begins to fall apart. The dark memories of her parent's death begin to wreak havoc on her psyche, members of her dance company turn up dead in the same horrific manner as her parents and neither her friends, her love of dance nor her doctor are able to help her. Adriana becomes convinced that the killer is out to kill everyone in her life and this only breaks her down even more eventually leading her to a dramatic showdown with the killer. There's enough story in Bloody Ballet to fuel a feature but Mullen and co-writer Matt Cloude's script adds an unnecessary layer by introducing a reporter who is investigating the murders. It's unclear until the end of the film that Adriana's story and the journalist's are on different timelines and though this was likely intended as a dramatic twist in the story, it comes off as unnecessary side plot which adds nothing to the story other than bloating the movie with boring exposition and confusing the plot by occasionally returning to this reporter who seems to have nothing to do with the story being told. Though Bloody Ballet is clearly an ultra-low-budget affair, the movie does punch above its class in a couple of places including the gialo-inspired cinematography which comes care of director Brett Mullen and Tony M. Collins, but it's the synth-heavy soundtrack from Matt Hill and NightStop that really shines. Though it features an unnecessarily convoluted plot and a hodgepodge of talent in front of the camera, Bloody Ballet still manages to be passably enjoyable, mostly for 80s b-movie nostalgia it elicits. Bloody Ballet is available on VOD November 13. Sounds a lot more like Black Swan than Suspiria. A little. The inner demon situation certainly rings closer to "Black Swan" though I think it's really neither - other than the fact that they all involve ballet. You are, of course, correct. But the soundtrack is really good!